By way of introduction, we wanted to share a bit of the back story about how the Centre came to be. The CeD was founded by Delvinia CEO Adam Froman, a pioneer in creating customer-centric digital experiences. For over 20 years, Adam has been working to understand the impact of digital technologies. e-Democracy has also been a key component of his company’s work. Adam and his team have assisted the City of Markham for more than a decade by designing and implementing communication and citizen involvement initiatives that use digital technologies to engage residents to share their opinions and participate in elections. Through this work, Adam was directly involved in the introduction and use of Internet voting in three municipal election cycles. While working on the voter engagement strategy for the 2010 election in Markham, Adam met Nicole, who, at the time, was a PhD candidate studying alternative voting methods. In collaboration with Ryerson University, Adam secured an NSERC Engage grant to fund Nicole to build upon the research Delvinia had conducted in previous elections and to study the impact of Internet voting in the 2010 Markham municipal election. 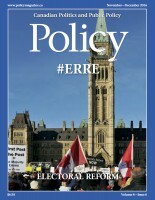 The resulting research report was released in September 2011 and this study, along with her work on other projects, established Nicole as a leading voice on Internet voting and alternative voting methods in Canada. In 2013, Delvinia engaged Nicole to help with the creation of the Voice of e-Democracy, an online panel of citizens powered by the company’s AskingCanadians online research platform. The purpose of the panel is to use digital and mobile technology to engage residents by gathering their input on important local issues, government business, or policy problems and then providing this information to municipal officials so that it can be incorporated into policy decision-making. As part of their work on the Voice of e-Democracy project, Adam and Nicole saw a need for and an opportunity to establish the Centre as a means to share knowledge about the impact of technology on politics and democracy. For more on the creation of the Centre, please see our Q&A’s with Adam and Nicole.